(aka the Transdimensional Authority series, which is misleading because book four of the series was mostly about the Time Agency – honestly, if you blinked, you would have missed the appearance of the Transdimensional Authority, and if you didn’t blink, well, Elsewhen Press accepts no responsibility for the cost of the surgery to rehydrate your eyes), in which we once again follow the intricate web of events that unfold in a Transdimensional Authority investigation (oh! – so we could have stayed with the other series name after all – it’s not easy keeping track when these sentences can be the size of a Sherman tank!). Why would someone, apparently chosen at random, have their consciousness swapped with someone else in another reality? How would someone, apparently chosen at random, have their consciousness swapped with someone else in another reality? Why would another three persons, apparently chosen at random, have their consciousness swapped with three other someone elses in another reality? Why would the entire bridge crew of a starship, apparently… well, you get the picture. What will happen to all these very confused people? How does the Alternate Reality News Service get scoops on these events so quickly? Why are their reporters acting so dodgy – do they have something to hide, or just issues? Who are the Pops, and can they help? Does the editor know what’s going on, and if she does would she even tell Noomi (our favourite TA investigator)? What was that noise from her office when Noomi was ‘interviewing’ her? Why am I asking you these questions when you haven’t even read the story yet? Or have you? Why are you reading this blurb if you’ve already read the story? Are you looking for an alternate reality, or just alternative facts? This is fiction you know, we tell it like it is. If you want alternative facts you better try a news service… or a politician. Oh, and if you’re looking for a news service, you could always consider the Alternate Reality News Service. Once again, Hannah B. Farrell has provided her inimitable artwork for the cover! 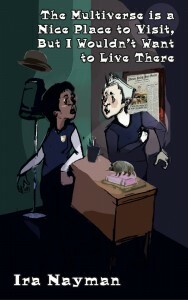 The Multiverse is a Nice Place to Visit, But I Wouldn’t Want to Live There, was published in a digital edition on 16th June 2017 and in paperback on 14th August 2017.